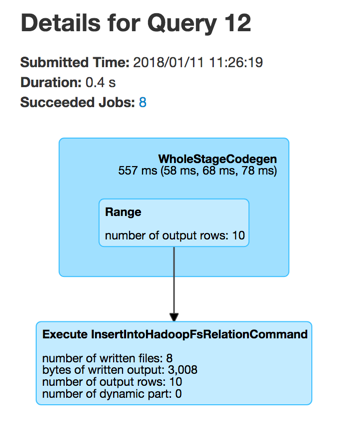 DataFrameWriter is the interface to describe how data (as the result of executing a structured query) should be saved to an external data source. DataFrameWriter is available using Dataset.write operator. DataFrameWriter supports many file formats and JDBC databases. It also allows for plugging in new formats. DataFrameWriter defaults to parquet data source format. You can change the default format using spark.sql.sources.default configuration property or format or the format-specific methods. In the end, you trigger the actual saving of the content of a Dataset (i.e. the result of executing a structured query) using save method. DataFrameWriter uses internal mutable attributes to build a properly-defined "write specification" for insertInto, save and saveAsTable methods. DataFrameWriter is a type constructor in Scala that keeps an internal reference to the source DataFrame for the whole lifecycle (starting right from the moment it was created). Spark Structured Streaming’s DataStreamWriter is responsible for writing the content of streaming Datasets in a streaming fashion. runCommand uses the input SparkSession to access the SessionState that is in turn requested to execute the logical command (that simply creates a QueryExecution). runCommand records the current time (start time) and uses the SQLExecution helper object to execute the action (under a new execution id) that simply requests the QueryExecution for the RDD[InternalRow] (and triggers execution of logical commands). Use web UI’s SQL tab to see the execution or a SparkListener to be notified when the execution is started and finished. The SparkListener should intercept SparkListenerSQLExecutionStart and SparkListenerSQLExecutionEnd events. runCommand records the current time (end time). In the end, runCommand uses the input SparkSession to access the ExecutionListenerManager and requests it to onSuccess (with the input name, the QueryExecution and the duration). In case of any exceptions, runCommand requests the ExecutionListenerManager to onFailure (with the exception) and (re)throws it. runCommand is used when DataFrameWriter is requested to save the rows of a structured query (a DataFrame) to a data source (and indirectly executing a logical command for writing to a data source V1), insert the rows of a structured streaming (a DataFrame) into a table and create a table (that is used exclusively for saveAsTable). saveAsTable saves the content of a DataFrame to the tableName table. Internally, saveAsTable requests the current ParserInterface to parse the input table name. saveAsTable uses the internal DataFrame to access the SparkSession that is used to access the SessionState and in the end the ParserInterface. saveAsTable then requests the SessionCatalog to check whether the table exists or not. saveAsTable uses the internal DataFrame to access the SparkSession that is used to access the SessionState and in the end the SessionCatalog. In the end, saveAsTable branches off per whether the table exists or not and the save mode. save saves the rows of a structured query (a Dataset) to a data source. Internally, save uses DataSource to look up the class of the requested data source (for the source option and the SQLConf). save uses SparkSession to access the SessionState that is in turn used to access the SQLConf. val df: DataFrame = ??? Otherwise, if not a DataSourceV2, save simply saveToV1Source. save does not support saving to Hive (i.e. the source is hive) and throws an AnalysisException when requested so. Hive data source can only be used with tables, you can not write files of Hive data source directly. save does not support bucketing (i.e. when the numBuckets or sortColumnNames options are defined) and throws an AnalysisException when requested so. jdbc method saves the content of the DataFrame to an external database table via JDBC. You can use mode to control save mode, i.e. what happens when an external table exists when save is executed. It is assumed that the jdbc save pipeline is not partitioned and bucketed. All options are overriden by the input connectionProperties. driver which is the class name of the JDBC driver (that is passed to Spark’s own DriverRegistry.register and later used to connect(url, properties)). When table exists and the override save mode is in use, DROP TABLE table is executed. It creates the input table (using CREATE TABLE table (schema) where schema is the schema of the DataFrame). bucketBy simply sets the internal numBuckets and bucketColumnNames to the input numBuckets and colName with colNames, respectively. mode defines the behaviour of save when an external file or table (Spark writes to) already exists, i.e. SaveMode. Records are appended to existing data. Do not save the records and not change the existing data in any way. Existing data is overwritten by new records. sortBy simply sets sorting columns to the input colName and colNames column names. sortBy must be used together with bucketBy or DataFrameWriter reports an IllegalArgumentException. assertNotBucketed asserts that bucketing is not used by some methods. format simply sets the source internal property. Parquet is the default data source format. insertInto inserts the content of the DataFrame to the specified tableName table. insertInto ignores column names and just uses a position-based resolution, i.e. the order (not the names!) of the columns in (the output of) the Dataset matters. Internally, insertInto creates an InsertIntoTable logical operator (with UnresolvedRelation operator as the only child) and executes it right away (that submits a Spark job). insertInto reports a AnalysisException for bucketed DataFrames, i.e. buckets or sortColumnNames are defined. insertInto reports a AnalysisException for partitioned DataFrames, i.e. partitioningColumns is defined. insertInto() can&apos;t be used together with partitionBy(). Partition columns have already been defined for the table. It is not necessary to use partitionBy(). getBucketSpec returns a new BucketSpec if numBuckets was defined (with bucketColumnNames and sortColumnNames). getBucketSpec throws an IllegalArgumentException when numBuckets are not defined when sortColumnNames are. getBucketSpec is used exclusively when DataFrameWriter is requested to create a table. createTable builds a CatalogStorageFormat per extraOptions. createTable assumes CatalogTableType.EXTERNAL when location URI of CatalogStorageFormat is defined and CatalogTableType.MANAGED otherwise. createTable creates a CatalogTable (with the bucketSpec per getBucketSpec). In the end, createTable creates a CreateTable logical command (with the CatalogTable, mode and the logical query plan of the dataset) and runs it. createTable is used when DataFrameWriter is requested to saveAsTable. assertNotBucketed is used when DataFrameWriter is requested to save, insertInto and jdbc. saveToV1Source creates a DataSource (for the source class name, the partitioningColumns and the extraOptions) and requests it for the logical command for writing (with the mode and the analyzed logical plan of the structured query). While requesting the analyzed logical plan of the structured query, saveToV1Source triggers execution of logical commands. In the end, saveToV1Source runs the logical command for writing. saveToV1Source is used exclusively when DataFrameWriter is requested to save the rows of a structured query (a DataFrame) to a data source (for all but DataSourceV2 writers with WriteSupport). partitionBy simply sets the partitioningColumns internal property.